You: Hey! What happened to Part 4??? One more warning: this section is much longer than the previous ones. I debated splitting it into two sections, and I may yet do that, but for now I decided to keep file types and databases together because they all fit under the umbrella of geographic data storage. 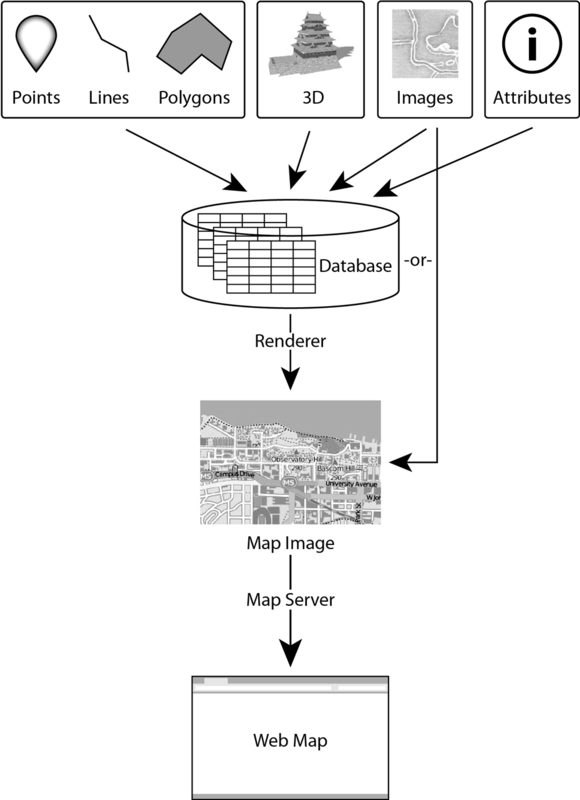 The steps of serving a map: 1) Data is aggregated, typically in a database; 2) a rendering engine is used to transform the data into an image, which can be done either on-the-fly or in advance and the image cached; 3) the image is served through a map server, which may also provide a rendering engine depending on the software used. The first order of business is to know how the data—the points, lines, polygons, and/or images you want to use on your map—are stored and how to access them. Without delving too deeply into the fundamentals of GIS, let’s review the two main types of GIS data. Vector data (points, lines, and polygons) are stored in tables as sets of geographic coordinates and attributes. They can be in CSV, ESRI Shapefile, XML/KML, GeoJSON, SVG, or a database format. Raster data, or collections of pixels that make up images, can be stored in a number of formats, including database formats, some of which have geographic data embedded. If the data includes coordinates that enable it to be projected accurately onto a map, it is said to be georeferenced. Of course, a lot of geographic data exists in a variety of other formats that can be used in desktop mapping applications like ArcGIS and Google Earth or parsed by script. In many cases, the files need to be interpreted or transformed for web use. A pair of open-source libraries provided by the Open Source Geospatial Foundation (OSGeo), called GDAL and OGR, are key for geospatial file processing. These may be incorporated into other programs to retrieve file information or convert between file types. GDAL deals entirely with raster files, while OGR is for vector files. As of this writing, OGR is able to read, create, and modify 25 different georeferenced file types, and GDAL can do the same with 45 raster types, plus many more they can either read or write but not both. These include a number of database formats. Obviously this is too much to cover in a short paper, but a few of those file types are the most commonly used on the web and worth discussing. 1. CSV: Comma-Separated Values (.csv), the simplest possible data table format, consists of a continuous string of values separated by commas and line breaks, and is usually read/modified using Microsoft Excel or similar table software. CSV is typically only used as a format for holding attribute data. In order for the data to be georeferenced, there must be columns for coordinates, almost always stored as latitude and longitude values. 2. ESRI Shapefile: Actually a collection of four or more files (.shp, .dbx, .shx, and .prj, optionally .sbn, .sbx, .xml, or .obr), each representing a different type of table or data manipulation, for years this has been the most widely-used format for transporting GIS data. It’s owned by ESRI, and lately being challenged for supremacy by KML and GeoJSON formats. Uploading shapefiles to web applications is typically done by first archiving them together in a zip file. 3. KML: Keyhole Markup Language (.kml, .kmz compressed; so-called because it was invented by Keyhole, Inc. before they were bought by Google) is an XML-based format for use in Google Earth. It’s readable/changeable in any text editor, and able to be projected by most mapping software that’s not made by ESRI. Now its own OGC standard, it mostly complies with the GML standard, but is much narrower in scope.16 For instance, KML doesn’t include datum or coordinate reference system information or metadata. 6. GeoTIFF: Despite the large profusion of raster formats used in GIS and supported by GDAL, many have very specific uses or are proprietary to particular software packages. For specialized purposes, it’s worth consulting the documentation to find the best format. GeoTIFF is the most widely-used image format with embedded georeference data. It is organized just like a regular TIFF (Tagged Image File Format; .tif) file, but tagged with a header that includes geographic coordinate and projection information. 7. PNG: The Portable Network Graphic (.png) was invented as a successor to GIF and has become a standard format for raster web graphics. It was designed for the web, not for print, so it only uses RGB (light-based) colors and employs an efficient lossless compression scheme.18 An open format, it is commonly used for the 256×256 pixel tiles in tile maps. While it doesn’t natively support georeferencing, tiles are assigned addresses when rendered that correspond to their geographic positions, and methods can be used in tile services that translate pixel addresses to lat/long coordinates. 8. JPEG2000: The folks who brought us the wildly popular JPEG (.jpg) compressed image format designed JPEG2000 (.jp2) as its successor. But the format was essentially stillborn, failing to be adopted by most of its intended users due to a closed architecture and lack of support for specific applications. It has superior compression and can store GML data to make it georeferenced and even add vector layers.15 Despite these selling points, .jp2 is rarely seen in web maps. Its intended purpose was to speed the transfer of large images, but tile services using PNG files have bypassed that need. 9. DEM: Digital Elevation Model (.dem) rasters are used strictly to show elevation data. They are in black and white, and each pixel is assigned a value from 0-255 according to the elevation of that location. Freely available from USGS and NASA, DEMs can be used by GIS software to create a variety of useful layers, from hillshading to contours to 3D models. Say you have a layer of features on your web map that you want to add new features to or delete features from, or add new information about the features. Where can you store these features to make them easy to change? Databases give the advantage of neat organization and quick access to the data. A relational database is a collection of tables that can be cross-referenced using a common identifying attribute (column). An index that just stores the feature identifiers and the tables they appear in is used to speed up operations with the database. A database management system (DBMS) is typically used to access and write to the database. This is a program designed to interface with the database, usually using a version of Structured Query Language (SQL). A server needs a DBMS to serve geographic data stored in a database to clients on demand (but not to serve map images that are not stored in a database). Several DBMS systems can interpret geographic data. The three most popular are listed below. SQLite/Spatialite: A “light” open-source DBMS, unlike MySQL or Postgres, SQLite doesn’t need a server to run. It also doesn’t require any set-up or configuration to run, but just uses a command-line interface to create and manipulate databases and tables, and writes the databases as .db files. Spatialite, an extension that gives SQLite geospatial support, must be downloaded separately. It is modeled on PostGIS and comes with its own graphics user interface. 15Scharl, A. and Tochtermann, K. (eds.). 2007. The Geospatial Web: How Geobrowsers, Social Software and the Web 2.0 are Shaping the Network Society. London, UK: Springer. 22Davis, Scott. 2007. GIS for Web Developers: Adding Where to Your Web Applications. Raleigh, NC: The Pragmatic Bookshelf.